San Francisco is a known hotspot for new and exciting ventures, including clothing stores. When it comes to retail, women are behind some of the hottest independent stores in the city. The following are just a few of our favorite female-owned outposts worth adding to your San Francisco songline. A few afternoons each week, shoemaker Isobel Schofield and her team let you into their studio where you can see the magic happen. Their craft is creating high-quality, made-to-order clogs in different designs. Shoppers are invited to customize their shoes and can select from different leathers, colors, heel heights, and straps. The options change with the seasons, so keep an eye out for new textures and hues. If you miss their open studio hours, you can always find the latest styles in their online store and on Instagram. This Valencia Street clothing store packs a lot of style into a relatively small space. Owner Pauline Montupet worked in fashion in New York before heading west. Lucky for us she decided to share her talent as a stylist with a wider audience and opened Le Point. Here, you'll find a mix of fun clothing labels and accessory lines for both women and men, including items from Bella Freud and Opening Ceremony. Rand + Statler is one of three Hayes Valley clothing stores owned by college friends Catherine Chow and Corina Nurimba, with Azalea and Welcome Stranger rounding out their retail empire. If you're looking for popular brands like Alexander Wang and Comme des Garçons, a quick scan of the store will assure you that you're in the right place whether you're in the market for men's or women's clothing. The store also has an enviable selection of jewelry, including pieces from Gabriela Artigas and Shahla Karimi. With a small Aesop store up front, Rand + Statler really is a one-stop shop for all your clothing and beauty needs. This tiny jewelry store in Russian Hill is the quintessential neighborhood gem. Owner Jenny Chung hand selects each piece, offering a mix of costume and fine jewelry at varied price points. In the store, you might find eye-popping pieces from Bliss Lau, delicate designs from Jennie Kwon, and affordable finds from Bing Bang. Just half a block off bustling Valencia Street, Anaïse feels miles away from the crowds. The store's minimalist design and muted tones make for an inviting space to browse the clothing and accessories hand-picked by owner Renee Friedrich. Originally trained as a pharmacist, Friedrich decided to pursue her interest in fashion by starting an e-commerce site and, eventually, opening this brick-and-mortar store. Expect the clothes, like the store, to feature clean lines and earthy colors. Pia (named after owner Pia Pernille Oien Cohler) is a welcome destination for those looking to fill their wardrobe with pieces from fashion-forward, high-end designers. Since opening in 2016, this airy, two-level store in the Jackson Square Historical District has amassed a list of faithful customers. This is not a surprise given the store's notable attention to detail, from the selection of well-crafted clothing to the bag of colorful candy that comes attached to your purchase. 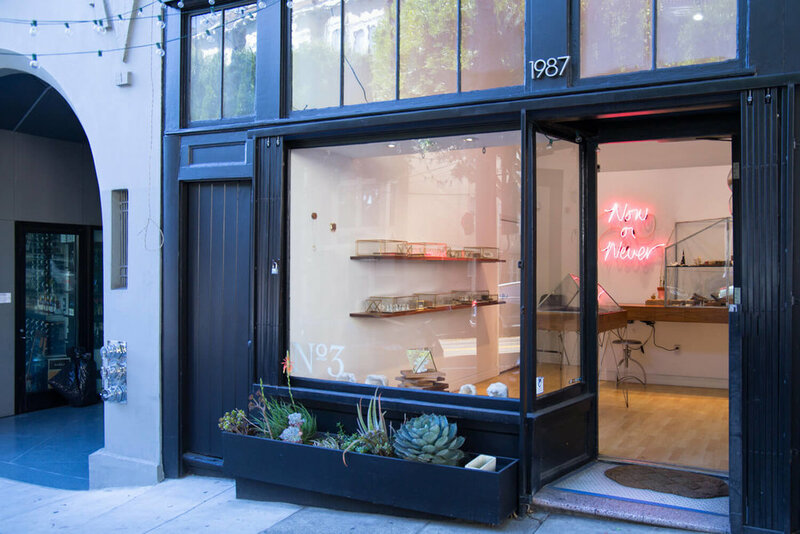 Shop owner and former Vogue employee Emily Holt exponentially upped San Francisco's shopping game with Hero Shop. The store, located in Lower Nob Hill, offers a thoughtful, eclectic mix of women's clothing and home goods. The blend of brands reflects a bit of fashion-forward New York style and laid-back California vibes. Did we miss your favorite place? We'd love to hear from you. Please share your recommendations here.